"A Place of Greater Safety" preceded Hilary Mantel's two Thomas Cromwell novels, but the same style was there a quarter century ago. The novel jumps between first and third person. It jumps between narration and dialog. Annoyingly, something Mantel insists on doing for no good reason, she often fails to identify who is speaking, and even when she does, she confusingly switches between names, nicknames, and titles. 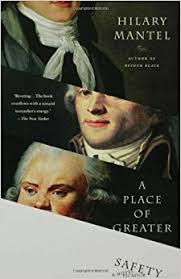 "A Place of Greater Safety" is the intertwined story of three main characters of the French Revolution: Georges Jacques Danton, Maximilien Robespierre, and Camille Desmoulins. The three knew each other from youth. They are dedicated to one another, except when they aren't. All aspired to revolution, to the overthrow of the monarchy, to the establishment of a republic. But their characters were different and Mantel exploits those differences to bring out the inherent contradictions in the French Revolution. I had never understood the Revolution and hoped this novel would bring me knowledge. But at heart the French Revolution maybe can't be explained. Whatever could explain such changes of attitude as described in this one sentence: "Louis XV is named the Well-Beloved. Ten years pass. The same people believe the Well-Beloved takes baths of human blood." The Revolution has too many factions, too many changes of alliances, too many betrayals and back stabs, to ever feel you know why things happened as they did. Maybe Mantel's own complex, sometimes confusing style of writing is designed for messy historical events such as the French Revolution. Mantel says, in a line of dialog that sums up everything: "It just shows, doesn’t it, how much worse things can get when you think you’ve hit rock-bottom? Life has more complications in store than you can ever formulate or imagine." Besides the story, besides the history, the writing itself contains gems of description. "They talked about the theater, about books and about people they knew; really though, they were only ever talking about one thing, and that was whether she would go to bed with him." "She was keeping a careful distance between them, buttressing her resolve with occasional tables." "Hérault de Séchelles was a connoisseur, a collector. He would travel the breadth of Europe for a carving, a clock, a first edition. He looked at Camille as if he had come a long way to see him, and found him a low-grade fake." "He was a plump little man with no visible bones in his body, the kind that — in normal times — you see squeaking in defense of the status quo." "At Versailles the deputies talked: as if there were some point in talking. When the Comte took the floor, disapproval rustled like autumn leaves." "So the prisoners are waved away airily by their judges — 'Go, you’re free.' Outside the door a steady man waits to fell them. Freedom is the last thing they know." Read "A Place of Greater Safety" if you want to know more about the men (and women) of the French Revolution. Just don't expect to understand that time. That's too much to ask of any novel.